Are you planning to host Easter dinner? If so, we are here to help make the process easy. Below you will find our helpful Easter checklists, menus, timelines and planning tips. Let’s get started. As with most events and family gatherings, you will want to do some initial planning. First, decide on the time of your meal. Will it be an Easter breakfast, brunch, or dinner? Next, determine the names of the guests who will attend. Then, it’s time to set the menu. 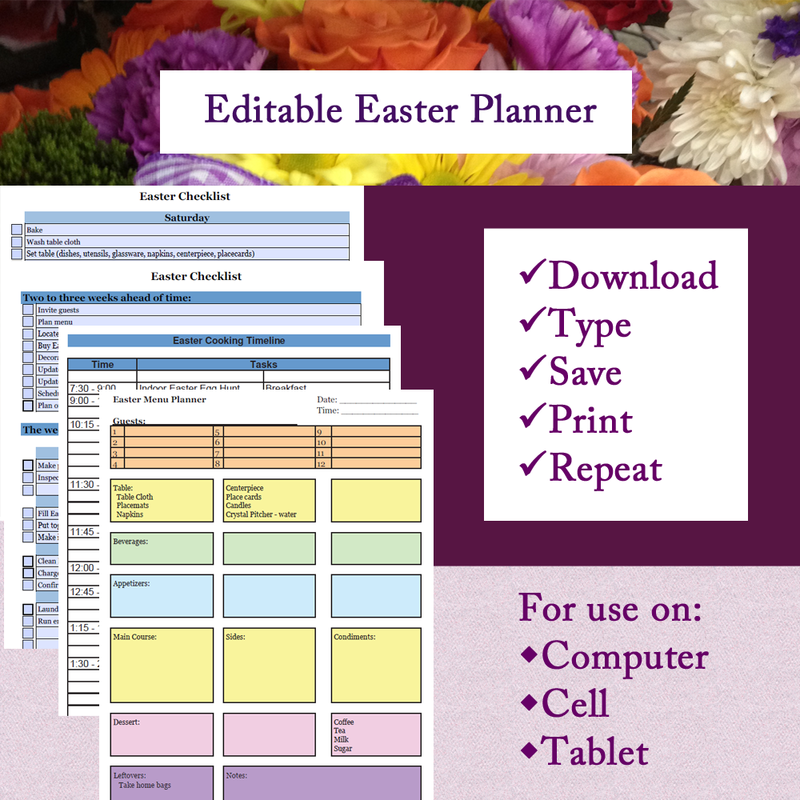 Click on the link below to print our Easter Menu Planner. Here, you can list the time of the event, names of guests, and food you plan to serve. If you’re planning to have leftovers, it’s always nice to have a pretty take home bag. 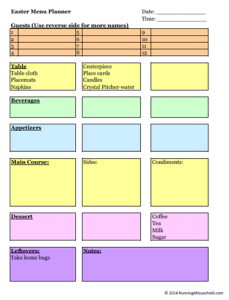 Since Easter brunch or dinner involves cooking various dishes, you’ll want to set up a timeline for the day, so that everything runs smoothly. 1. First, determine what time you want to eat. For our example, let’s say that dinner will be served at 2:00 p.m.
2. Next, determine what time your guests should arrive. For our dinner, we are asking guests to arrive at 1:00 p.m. Note: We know that some guests will arrive a little earlier, and some will run late. Therefore, we expect the overall arrive time between 12:45 – 1:15. Our social hour is planned for 1:00 – 2:00. 3. 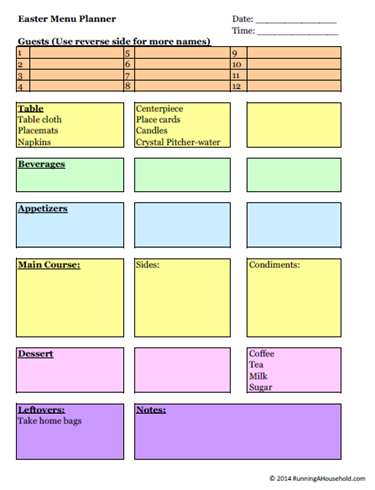 Then, fill out the Easter Meal Timeline to determine your cooking times and tasks for the day. We will serve a pork roast. It weighs just under 3 pounds, and needs to cook ½ hour per pound. Once it comes out of the oven, it will sit for 15 minutes prior to carving. This keeps it nice and juicy. Now that everyone agrees you are hosting Easter brunch or dinner in your home, there are quite a few things you can do ahead of time to get ready for the event. 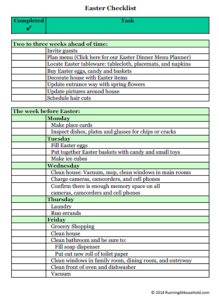 Here is an Easter Checklist to help you prepare for the holiday. 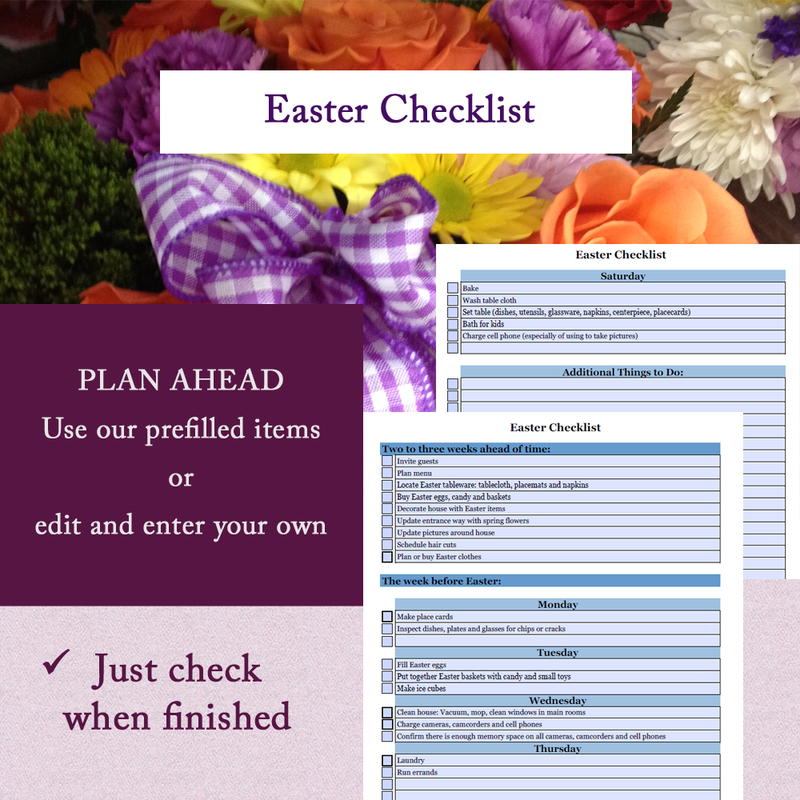 At the end of this section, you will find a printable version of our Easter Checklist. 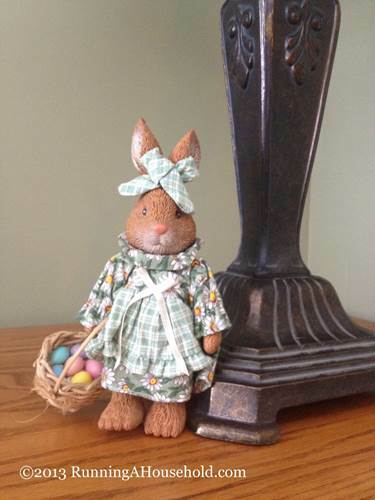 Sunday: Happy Easter! Enjoy the day. 1. Editable: You can download and type your info right on the form. 2. Portable: Use on your cell phone, tablet or computer. 4. Reusable: Save your plans and use year after year. 5. Printable: Print if needed. Keep your Cooking Timeline handy while cooking. 6. Ink-friendly: Designed to save you ink by using fewer graphics. We hope that you and your family have a Happy Easter! 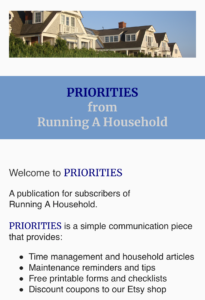 This entry was posted in Meals and tagged Easter checklist, Easter cooking timeline, Easter dinner timeline, Easter Timeline, how to prepare for Easter on March 20, 2014 by Running A Household. 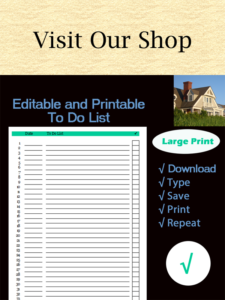 We are so glad you found our Easter printables helpful. Thanks for letting us know. We truly appreciate your feedback. Wishing you and your family a Happy Easter.